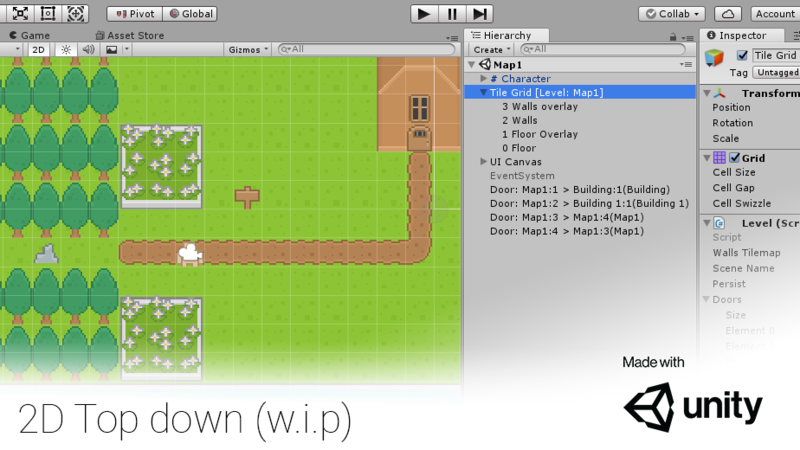 Map loading system, where scenes doors can go between scenes. Scenes can be set as persistent and are not unloaded when a new scene is entered. Scenes are unloaded automatically when a non persistent scene is left. Tile movement, with directional overriding (meaning a key can be pressed to override a direction but when released the old direction can be re activated). Its not perfect and needs some extra features to feel natural but works in most situations. Collisions work based on a specific Tile map layer and checking for if a tile exists in a position. Ability to view signs and read their text. I plan to add more elements such as NPC’s with dialogue conversations, items and animations. Note: The game runs a bit strange in the browser, but still shows off the current features.